With most small Andalucian towns acting as fortresses during the Moorish occupation, many of the towns still show evidence of Arab settlements. While some of them lie pretty far off the beaten track and offer a more authentic insight to Andalucian culture, others attract tourists with stunning megalithic ruins. One thing they all have in common though; friendly residents and a slow pace of life. 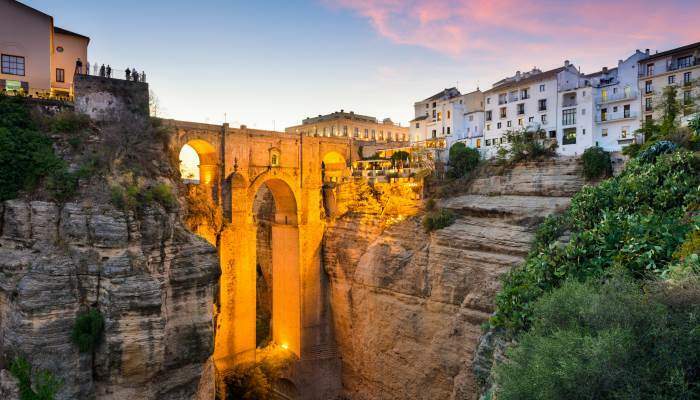 An eye-catching bridge connects two jagged rock faces in Ronda, overlooking a chasm 100 feet beneath. It’s quite a sight from both the top of it and below, and, unsurprisingly it’s one of the town’s main draws. But another equally impressive incentive to visit lies in the Cueva de la Pileta. This cave is the home of 20,000-year-old drawings which you can admire by torchlight. The town itself has seen the likes of Ernest Hemmingway and Orson Welles wandering its cobbled streets, perhaps for literary inspiration. 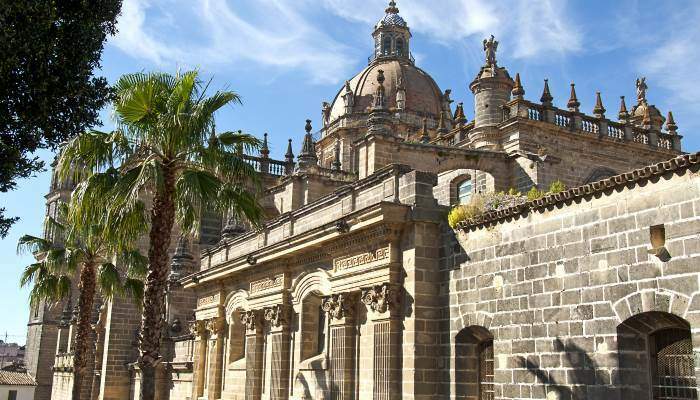 Jerez has a Moorish fortress dating back to the 11th century, but its claim to fame lies in its Sherry production. The vicinity surrounding the town is one of few places in the world that yields the Palomino grape, giving the drink its distinctive flavour. There are more than 10,000 hectares of vineyards in the area, breathing life into the charming palm-lined squares and streets. And don’t be surprised to find yourself being serenaded by a flamenco band while you sit at one of the many al fresco bars. Hopefully while savouring some of the town’s special fortified wine. This quintessential pueblo blanco sits on a hill with a craggy backdrop juxtaposed against its whitewashed houses. Its air is thick with the scent of orange blossom and quince, and at its high points, you can admire views of the Guadalete River. Its location within the Grazalema Natural Park means it is part of a UNESCO Biosphere reserve consisting of limestone cliffs and gorges as well as an array of wildlife including black vultures. 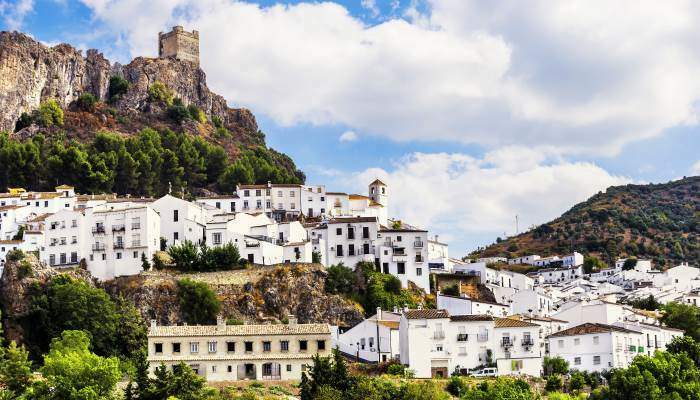 Previously used as an outlook for Moorish civilisations, Zahara de la Sierra has a watchtower which acts as a great viewing spot over the vast valleys of green below it. 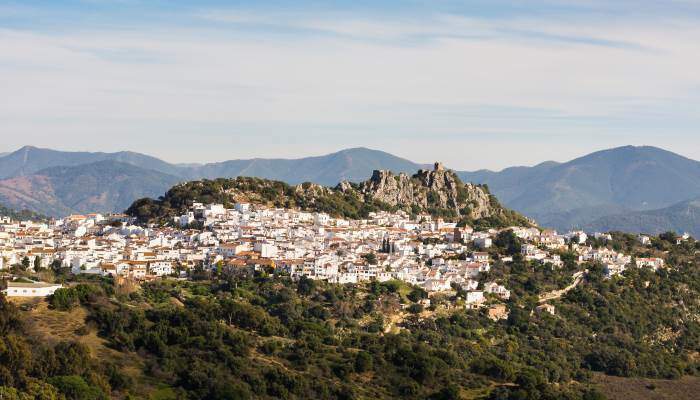 Perched within the Andalucian mountains, this whitewashed town offers up gorgeous views of the coast below it and Gibraltar, and, on a clear day, you can even see as far as Morocco. Though its views are major draws, so too are its medieval streets and bird species. It’s not uncommon to see huge eagles sweeping across the skyline, and kestrels are said to make their nests within the walls of some of the buildings. 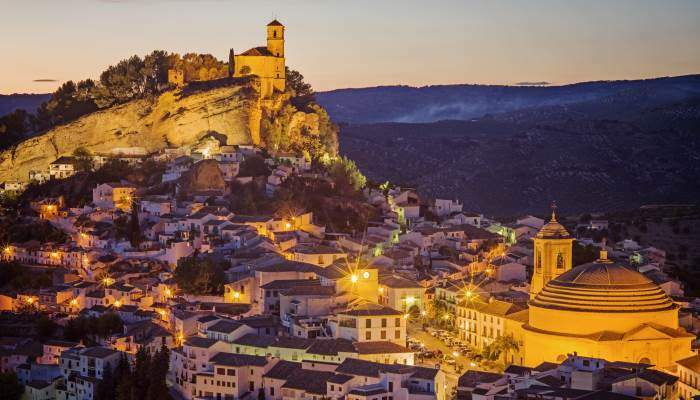 Another thing you can do here is go on walks around the pretty hills or the looming El Hacho, which towers over the town at about 600 metres above sea level. 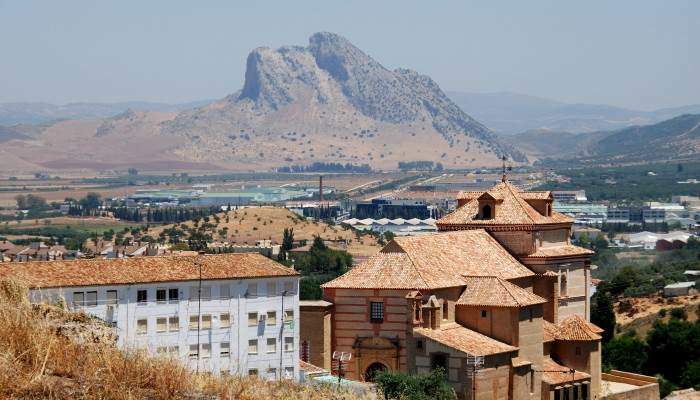 With roots in the bronze age, visiting Antequera could easily turn into a lesson in Andalucian history. Excavated Roman baths lie in the south-west of the city, and at its core is the impressive Giants’ Arch, a 16th century monument. In summer, swathes of sunflowers bloom in fields surrounding it, creating a spectacle of colour. And finding it won’t be difficult, because towering over it is a huge limestone crag nicknamed Lovers’ Rock. 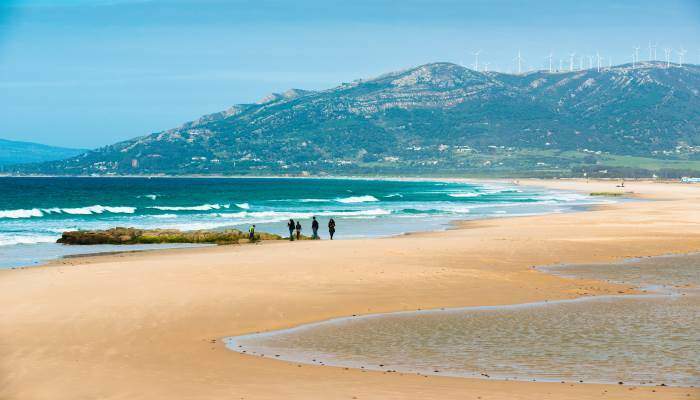 With around 10 kilometres of sandy beaches stretching across its coast, Tarifa is a beautiful coastal town extremely popular with watersports enthusiasts. If you fancy yourself as a surfer and have a love for nature, combine two passions by visiting one of Andalucia’s southernmost towns. One day you could be chasing point breaks, and the next, you could be on the look out for orcas and dolphins on a whale-watching trip off the coast of this Spanish town with a decidedly Moroccan feel. Adding to Andalucia’s impressive portfolio of white-washed towns is Cazorla, lying just over an hour away from Jaen and two from Granada. It’s on the edge of Cazorla National Park, a UNESCO biosphere, which means day trips into the park are easily arranged. Due to its high elevation, its summers are slightly cooler and winters milder, but that doesn’t stop the onset of tourists visiting for its castle, cathedral and fortress ruins. With Neolithic, megalithic, Bronze and late Middle Age settlements adding to its historical prowess, Montefrio is an archaeological melting pot. Largely unspoilt by tourism, it’s a friendly town of olive farmers. 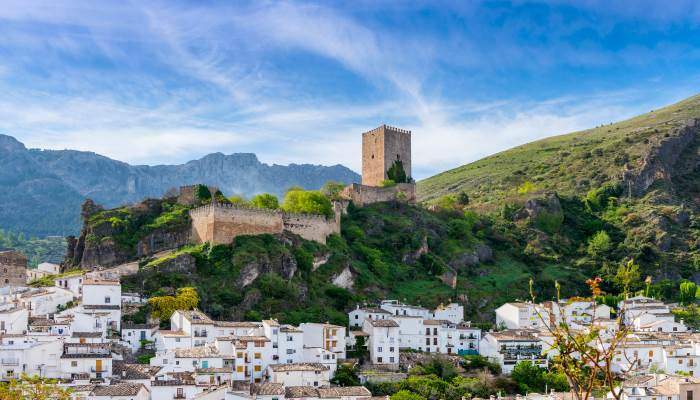 Places of interest include El Castellon, a medieval village with lovely views of the Arroyo de los Molinos stream and waterfalls, and the 14th-century fortress which stands at the top of the town. Be sure to fit in a visit to Las Peñas de los Gitanos as well for prehistoric tombs and Roman remains.